The story begins with Frank Cotton buying the sinister Lemarchand’s box. He takes the box and shuts himself in his bedroom. He has one thing on his mind: contacting The Order of the Gash. Frank has heard tales of them and believes they can show him pleasures greater than he has ever known before. He has enjoyed a sinful and debauched life and is tired of the pleasures of this world but, as he fiddles with the mechanism of the puzzle box and tries to open a doorway between worlds, he never dreams that the Cenobites’ idea of pleasure and pain might be very different from his own. By the time Frank finally solves the puzzle it is too late to think about these things; the box is open and so is a doorway to a world of pain. Some months later, Frank’s brother Rory moves into the house, they co-owned. Rory brings his wife Julia with him. Nobody has seen Frank since the previous summer, but he was known to be a drifter and Rory has no reason to think that Frank will be coming back anytime soon. Julia is dissatisfied in her marriage and longs for the time—that one time, just before her wedding—she spent with Frank. Rory is unaware of any of this. He is equally unaware of the amount of time his wife is spending in the blacked out bedroom. Julia probably has no idea why the room attracts her until Rory cuts his hand on a chisel and his blood drips onto the floor. Those few drops of blood are enough to open a doorway for Frank’s return, but he needs more blood to fully regenerate the butcher’s shop of spare parts that form his present body. If he doesn’t get it—and soon—he will slip back into the world of the Cenobites. Fortunately for Frank, Julia is willing to help him get the blood he needs. 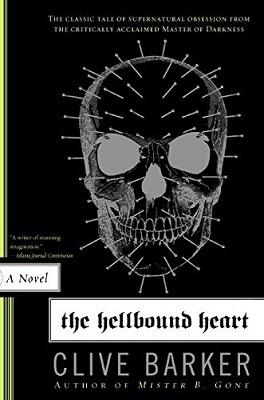 The Hellbound Heart is rather a dark story that dishes up significant helpings of blood and gore that some readers may find hard to tolerate, but those who have seen the Hellraiser movie will probably have a good idea what to expect. The Hellbound Heart is a well-written book and I couldn’t help but feel sorry for Rory, who adored a wife who didn’t love him back. In fact, I was forced to wonder which character really had the hell-bound heart—Julia or Frank. I suppose, in their own way, they were both equally damned.